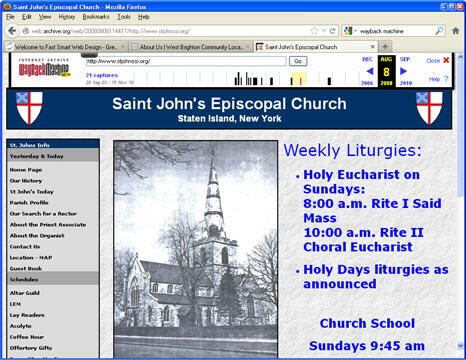 St. John’s Episcopal Church website in 2008. Fast Smart Web Design provided the visual-design smarts, of course, but the most important thing we did was to turn it over to Denise Ciluffo, the parish administrator, and Fr. Cole. 1. Someone is paying attention. Denise keeps on top of the site using Contribute, despite being in the office only three days a week with plenty of other things to do, like the Sunday bulletin, the newsletter, programs for the senior center associated with the church, and so on. But she’s the epicenter of all information flow at the church, so who better to update the website? 2. Local information is sticky. “Sticky information” is information that is hard to transfer or explain to someone else, partly because it’s based on experience and partly because it’s nearly unconscious, like a habit. Because Denise and Fr. Cole are so familiar with the parish, they know when a piece of information is important and needs to be on the site (and also when a piece of information is problematic and shouldn’t be put up). We would have no idea–all information is of equal weight to us. The result is that the site is rich with information–everything from lay-minister schedules to events to sermons. It also demonstrates the personality of this parish far better than any mission statement would do. The same is true of other self-maintained sites we’ve helped set up–the Unitarian Church of Staten Island just buzzes with activity, Christ Church New Brighton is full of photos of parishioners enjoying themselves at events, Meals on Wheels of Staten Island is as comforting and comfortable as an old slipper, and ArtPM changes and evolves as Naima comes up with new ideas every month or so. It’s not to say that a web firm can’t do a good job maintaining a site for a client, but it helps to know that organization well. Until you do, though, you need to ask lots of questions and listen for what isn’t said–what’s assumed, what’s habitual, and what sets off unexpected sparks. This entry was posted on September 3, 2012 at 7:14 pm and is filed under church, Staten Island, website design. You can follow any responses to this entry through the RSS 2.0 feed. You can leave a response, or trackback from your own site.